An affected Ash Tree in the neighborhood. Tree-lined streets and shady, mature trees surrounding homes are some of the reasons Bridge Pointe continues to be a treasured Northland neighborhood. As homeowners, we all know the necessity of maintenance and that includes our lawns and landscaping. Even our best efforts to rake, weed and plant can’t stop some invaders. 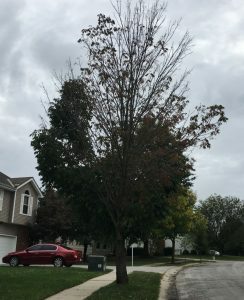 The Emerald Ash Borer has been a nuisance in our area for some time and in 2012 Clay and Platte Counties were quarantined due to the high number of Ash trees in our area. Several Ash trees throughout the neighborhood appear to be in distress. If you have an Ash tree on your property, take a few moments to inspect it for health and disease. Outward signs of disease or potential invasion of the Emerald Ash Borer include: sparse leaves at the top of the tree and/or branches dying at the top of tree, new spouts on the bottom or lower portion of the tree, short vertical splits in the bark, and increased woodpecker activity in the tree. Traditional treatments for Emerald Ash Borer were limited to removal, but other options exist for treatment. The City of Kansas City can help with removal if necessary. Fill out the online form or call the City for removal. Or, go to www.kcmo.gov, click on 311 to “Report an Issue.” Select “trees” from the dropdown menu, then type a description of the issue and include the quarantine number in the space provided. Quarantine numbers are found on the tag attached to the tree. While the City will not replace your tree, the Missouri Department of Conservation provides free and inexpensive saplings, along with great resources on Tree Care. Another example of the problem the Emerald Ash Borer is causing. Prevention options, such as insecticides, are also available. See the Missouri Department of Conservation guide for information, or contact a local tree, lawn and garden company for help. 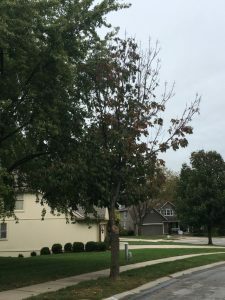 With no natural predator, the Emerald Ash Borer will destroy beautiful trees and can change the face of your home and the Bridge Pointe neighborhood. Please examine the trees on your property and take action if removal or treatment is needed.